While condos may be more affordable to buy, they frequently have higher assessments for their monthly Homeowners Association (HOA) fees. 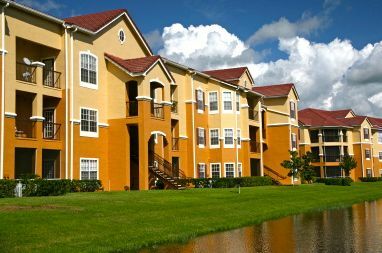 While active adult communities commonly feature single-family homes or attached villas, some developers also include the option of apartment-style condominiums. Designed as mid-rise or high-rise buildings, with features like elevators and underground parking, these thoughtfully-designed condos provide benefits which appeal to many active adults. Yet, condos in age-restricted communities also come with some drawbacks. Here are a few points to keep in mind when considering apartment-style living. No Maintenance — Choosing an apartment-style condominium lets homeowners enjoy their active lifestyles without worrying about yard work or exterior home maintenance. Condos are often available in smaller layouts, making them the perfect size for singles or those who don’t want the upkeep of a larger home. Added Security — With secure entry doors, a staffed front desk or a building doorman, condos can provide an added layer of safety. This is often a comfort for singles living alone or for active adults who frequently travel. Buildings which also contain their own exercise, hobby or game rooms also let homeowners make use of the amenities without going out at night or in inclement weather. Affordability — Apartment-style condos are often a more affordable option than attached villas, townhomes or single-family homes. This is especially true in more luxurious resort-style communities that are located in popular retirement destinations. Location — Developers of active adult communities typically include apartment-style condos in more urban areas where land is more limited. They can be ideal homes for active adults who want to live near the cultural and recreational attractions found in cities. Higher Assessments — While condos may be more affordable to buy, they frequently have higher assessments for their monthly Homeowners Association (HOA) fees. These higher assessments are collected to pay for shared building features like elevators, underground parking or a doorman. Shared Walls — Depending on the building, living in an apartment-style condo may bring active adults a little too close to their neighbors. Footsteps, arguments, TV shows and other sounds can bleed through from the neighbors who live in condos beside, above or below. Distant Parking — Whether the building provides outdoor or underground parking, residents are likely to have a long walk from their cars to their homes. This can be even more of a problem when lugging in grocery or other shopping bags. Resale Value — Apartment-style condos may be popular with some active adults, but most homebuyers in this demographic prefer attached villas or single-family homes. Unfortunately, that can negatively influence the condo’s resale value when it comes time to sell.